MarcieMom received an email from The Honest Company, a company founded by Jessica Alba and Christopher Gavigan, and learned that it’s a company created ‘to help moms and to give all children a better, safer start’. Its products come in bundles, namely the Diapers Bundle and Family Essentials Bundle which is comprised of skincare and cleaning products. These products are natural and non-toxic which interests MarcieMom and she contacted Janelle Sorensen, Communications Manager from The Honest Company to find out more on what’s going on inside their baby diapers. Marcie Mom: Thank you Janelle for taking time to help answer my questions, which other parents who have children with eczema or sensitive skin may likewise also have. I’ve checked out your lovely website and noted that ‘100% Natural’, ‘all-natural’ are used for your products. From an interview that I’ve done with VMV Hypoallergenics, I learnt that the term Natural is not regulated for skincare products. Does the same go for diapers? Janelle Sorensen: Currently, there aren’t any standards or certification for “natural” or “organic” as they may apply to disposable diapers. And, just to clarify, while some of our products are 100% natural, our diapers are not (but, they’re very, very close!) We use a chlorine-free, wood-pulp fluff (from certified sustainably managed forests), a wheat and corn starch BIO-core (which significantly reduces the need for SAP), and a plant-based PLA for the outer layer, inner layer, and moisture barrier layer. You can learn about all the details and ingredients on our website. https://www.honest.com/product/honest–diapers Unlike most other diaper companies, we are completely transparent about what’s inside our products. Note (by Marcie Mom): SAP/ Super Absorbent Polymer such as sodium polyacrylate is a polymer that can absorb 200-300 times its mass in water. PLA/ Polylactic acid is derived from renewable resources, such as corn starch. Marcie Mom: Relating non-toxic, it’s really great to know that your products are chlorine-free, no petrochemical, no PVC, no phthalates and fragrance-free. Moms like me who are always on the lookout for hypoallergenic products truly appreciate this. Do you actively track how many of the allergens that are currently on the list compiled by American Contact Dermatitis Society are in your products? Also, is your product registered with The Contact Allergen Replacement Database (CARD) (a database for patients in USA to find out which skincare products are safe for them based on their allergy/patch test results)? Janelle Sorensen: Just to clarify again, most of our products are 100% petrochemical-free, but the diapers are not – just very, very close. We’re making changes to the website that will better describe everything, so we don’t unintentionally mislead anyone. (We’re committed to constantly improving every facet of our work!) In regards to your questions, we’ve just started tracking allergens because we’ve heard from so many families living with allergies. So, it’s a growing priority for us in regards to future products, reformulations, and even website updates. If we are using common allergens, we want it to be easy for consumers to know – it’s a part of our company ethos to make life a little easier for parents! We are not registered with CARD, but I’ll put it on our internal to-do list. Thanks for the recommendation! Marcie Mom: When choosing products, moms have to take note that not only the ingredients but also the manufacturing process can introduce allergens. For instance, the case against the use of polypropylene was because acrylic acid was used in the process. 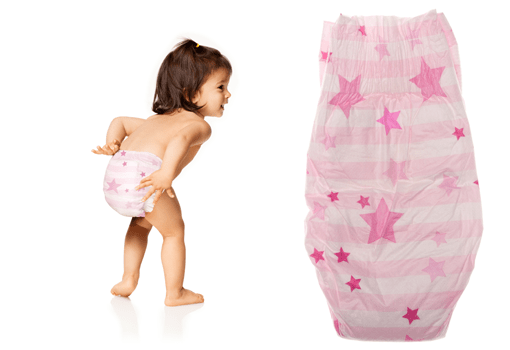 Do you manufacture your diapers in USA? Also, how do you monitor your production sites (cradle to cradle certified)? Janelle Sorensen: Currently, all of our products are manufactured in the USA, but the diapers are made just across the border in Mexico (it was the nearest facility we could find with the technology to make our innovative diapers). We’re hoping to see development of similar facilities in the USA soon. Still, we are very scrutinizing about the manufacturers we work with and our Co-Founder and Chief Products Officer, Christopher Gavigan, is very hands-on with the facilities to ensure the highest quality end products. We aren’t Cradle-to-Cradle certified yet, but it’s a goal we look forward to reaching. Marcie Mom: I’ve also read from your website that you’re in process of getting sustainability certified. That’s a complex systems involving amongst others minimizing waste and maximizing reuse in your office, your products, including making your products flushable and biodegradable! Personally, I can’t imagine flushing diapers or wipes down the toilet because my toilet choked just on the amount of toilet paper I used! Tell us more about how flushable your products are and how long it takes to biodegrade. Janelle Sorensen: The wipes are flushable, but the diapers are not. And, it’s hard to know how long it would take anything to biodegrade – it totally depends on the environment and landfill conditions. Still, given the right conditions, (which it’s true – most landfills can’t guarantee) our diapers will indeed biodegrade faster than others on the marketplace today. As with everything else, we’ll do everything we can to constantly improve – to be as safe, affordable, and eco-friendly as possible. Marcie Mom: Coming to our environment – I read with delight that chlorine is not used in your diapers. I understand that chlorine is used in the process of the woodpulp that is in diapers and it’s not so much the chlorine itself but the chlorinated toxins that are released into the environment during processing. The dioxin created when the wood pulp is bleached has been linked to cancer but has also been studied to be in such small amounts that it’s safe. Can you explain to us why you do not use chlorine? Janelle Sorensen: Dioxins are the most potent cancer-causing chemicals known to man. Even if there’s little left lingering on the final product, we’d rather not be a part of releasing any of it into the environment. Our children and the generations to come deserve a cleaner, healthier environment. Marcie Mom: Thanks Janelle for helping parents to understand more of what’s going on inside baby’s diapers; this will surely add comfort to those with children with sensitive skin. p.s. to readers of eczemablues.com, I didn’t receive any money from The Honest Company for this interview and I can’t even take advantage of their Free Discover Kit (Free 7 Day Trial) and Free Disposable Wipes cos I’m in Singapore! Thanks Kia 🙂 Most people just decide between using cloth or disposable, but not so much into which disposable. Myself, I decide based on the softness cos my baby’s skin get irritated when the material’s rough. Wow! I think this is really great since it is natural and the fact that Jessica Alba was one of the founder. Hahaha..Great review!